Enhance your home with beautiful hardwood flooring that fits your budget. Full of abundant character and color variation, Bruce Plano Gunstock Oak celebrates the beauty of natural hardwood. Enjoy natural features, including mineral streaks, knots and small holes and minor milling imperfections. Design your floor to your unique tastes with a variety of width and color options: 3 fashion-forward colors available in 3-1/4 in. wide scraped solid hardwood and 3 additional popular colors available in 2-1/4 in., 3-1/4 in. and 5 in. 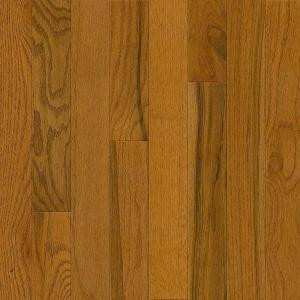 wide traditional smooth-faced hardwood; or 3 in. and 5 in. wide engineered hardwood. Plano features a 15-year limited warranty and protection from everyday wear and tear with our Dura-Luster finish. Plano hardwood floors are made with more than 90% domestic content. 22 sq. ft. per case and case weight: 62 lbs. Buy online Bruce Plano Oak Gunstock 3/4 in. Thick x 3-1/4 in. Wide x Random Length Solid Hardwood Flooring (22 sq. ft. / case) C1111, leave review and share Your friends.